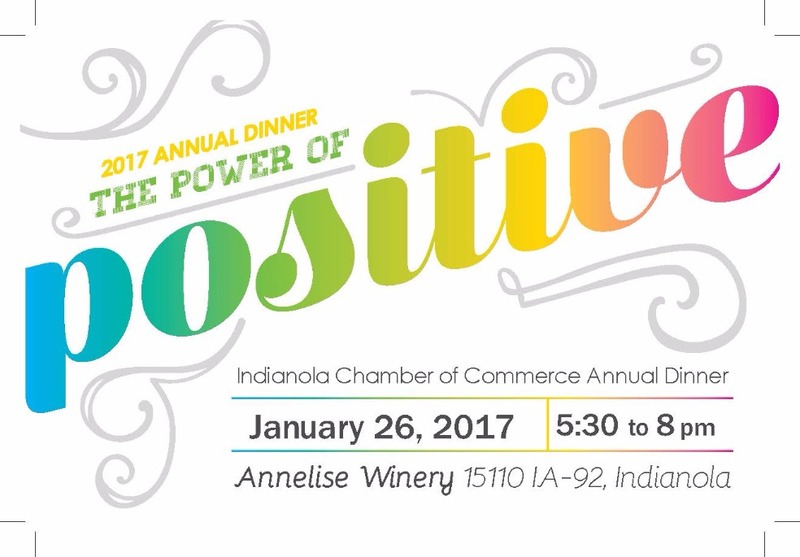 The Indianola Chamber of Commerce would like to invite you to the 2017 Indianola Chamber of Commerce Annual Dinner and Award Celebration. The Dinner will be held at Annelise Winery, 15110 IA-92, Indianola, IA 50125. 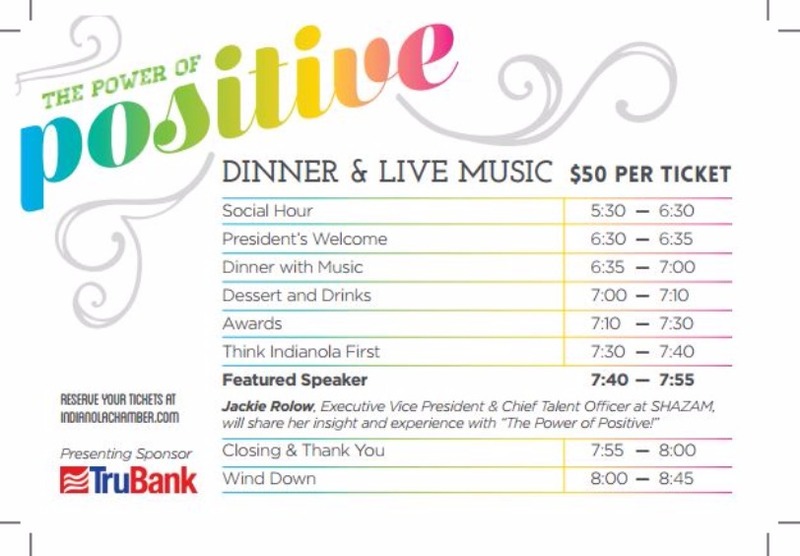 This years theme is "The Power of Positive", and Jackie Rolow from SHAZAM will be in attendance to speak on how this has helped her in her career. Looking forward to hearing from our Speaker, Jackie Rolow, Executive Vice President & Chief Talent Officer at SHAZAM, who will share her insight and experience about "The Power of Positive"! Jackie has been a vital part of the SHAZAM Network for the past 24 years. She started as a part-time human resources (HR) clerk and receptionist in 1992 and worked her way up to her current role as vice president of human resources. Jackie leads the charge to establish and enhance solid HR management practices and retain top industry talent. She plans and coordinates all corporate wide HR functions, consistent with the strategic direction set by the company. Jackie manages information and recordkeeping systems that protect the legal rights of employees, applicants, former employees and SHAZAM. She also collaborates with managers to help them achieve their goals. ​Dan Trilk carries on the hallowed tradition of great musical storytellers, such as Tom Waits and Bruce Springsteen, through his debut album Iowa Weather. The album charts Trilk’s journey as a young, single man exploring the world to find that his destiny carries him home to the Midwest as a husband, father and teacher. In this way Iowa Weather is akin to flipping through a “sonic photo album.” Trilk brings his talent as an accomplished multi-instrumentalist, and his ease in almost any genre, to the stripped down tunes of this sonic photo album. Through the songs you experience shades of folk, blues and bluegrass all laid perfectly over the lyrical backdrop of Iowa’s distinct landscape as in “Mississippi Woman,” Trilk’s ode to the love of his life, Ellen. Although his songs detail his personal journey, the power of Trilk’s music lies in it’s ability to reach the listener through their own experiences. His live shows are routinely peppered with requests for a fan’s favorite because they have built their own memories into the lyrical content as all great songs invite you to do. 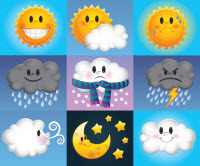 For Midwest audiences Iowa Weather will make them feel like they’re having a beer with an old friend, taking stock of where they’ve been, and celebrating the good life with the one’s they love.